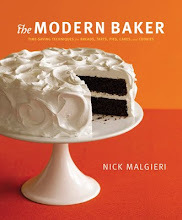 This week’s Modern Baker Challenge recipe is the Devil’s Food Cake from the cover of the book. And I suspect that, like my friend Renee, a lot of people bought the book largely for the promise of this cake. First things first, there is an erratum in this recipe in the original hardback version of the book. 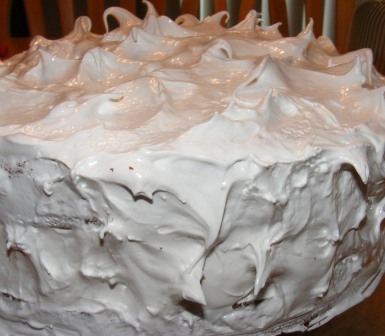 The fluffy white icing requires 1 1/4 cups granulated sugar, rather than the 1 cup called for in the recipe. This error was corrected in the paperback version of the book. This cake derives its characteristic moist, chocolatey crumb from a combination of dark brown sugar and unsweetened chocolate. And it’s a good cake. Really good. 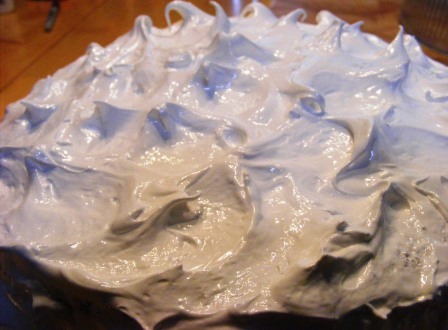 But for me, what sets this cake apart is the frosting. Nick calls this “fluffy white icing”, and I was expecting it to be like a white buttercream. But with the combination of egg whites, sugar, and corn syrup, all of which are heated then whipped, it was more like marshmallow. Marshmallow creme, to be exact. And who doesn’t love that? This was a great cake, one I’m sure I’ll make again. Definitely worth the price of the book. And I think that, like Renee, anyone who bought the book for this cake won’t be disappointed.